Summer is a great time for get-togethers and seeing friends. There are beach days and cookouts, and I like to get outside as much as I can. For a warm weather lover like myself, Massachusetts weather is tolerable about half the year. So I admit that playing board games isn’t as attractive in the summer months. I’ll save the hours of gaming and rules explanations for the winter, thank you very much! But that doesn’t mean I stop playing altogether! Rather, in the summer it’s great to play some lighter or party games. Lately, we’ve been playing a lot games that deal with bluffing or just down right bullshitting other players. Hot languid nights make it easier to loosen up and put your gullible friends to the test. Some perennial favorites of these types of games are Skull and Spyfall. Both of these games are also great for opening a night of gaming. Full disclosure: I am terrible at bluffing. Terrible. I giggle, and I can’t make a poker face at all. So I never win at these games, but that’s okay. If you’re looking to have a lot of fun and learn something quickly, check these out. Skull is a quick card game with gorgeous art for four to six players. Each player picks a deck of four cards. Each deck has a one skull and three flowers. The point is to bet how many cards you can flip over without flipping over a skull. If you get a skull, you lose one of your cards randomly selected by another player. The more you bet the more you might lose, but it’s the only way to win. The first player to successfully achieve two bets wins! How to Play: One player starts and places a card face down, choosing either the skull or a flower. Once it rounds back to the first player, she can decide to play another card face down or make a bet. The player bets how many cards she can flip over before turning over a skull. The following player can do the same, but once the betting starts it must continue with each player raising or passing. Then the person who makes the last best, for example, saying that they can flip over five cards without a finding a skull, has to make the attempt. The catch is that you have to flip over all of your cards before moving on to someone else’s. So, if you’re looking to “skull” someone else and make them lose a card, make sure you don’t get stuck cashing in your bet! Skull is great to try and figure out the nature of your friends. Are they devious and try to skull you every time, or are they secret skullers? Do you have that one friend who rarely takes a bet, but when they do it’s usually for something ridiculous like flipping over five flowers out of six cards? It’s fun to try and get a read on everyone. Plus, the box is small, portable, and perfect to bring along to your next cookout. Spyfall is also a card game that requires you to keep secrets from your friends, but also to try and discover some secrets. 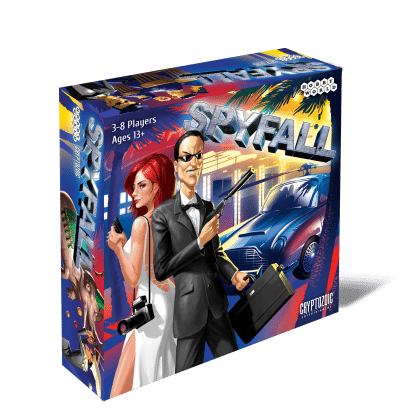 Spyfall–there’s a pretty good chance the Adele James Bond “Skyfall” will get stuck in your head, and you’ll be convinced that Spyfall is the real name of the song–is for four to eight players. In every game, there is one player who is the “spy” and the other players who are characters in various locations. The point of the game is for the spy to try and figure out where she is and for the other players to ferret out the spy. The roles are randomly and blindly assigned. Some of the locations are places where you’d expect a spy, like a sleazy nightclub, but there’s also a bank, a pirate ship, and … a Crusader camp? There is a lot of variety. Non-spy characters know where and who they are, like a teller at a bank, but they don’t know who else knows, so they ask questions to find the liars and the bewildered. Questions like, “How did you get here today,” or, “Why are you here?” These questions can vary differently and can help players figure out who the spy is. If she says she took the bus to the space station, then it’s a tip off that she may not know where she is. The spy gets to ask the same kind of questions and can make them purposely vague or pointed to throw off other places and, of course, try to figure out where the heck they are. This game is best played over drinks. Honestly, the more drinks the better, provided you have a designated driver. The answers get better, the questions make less sense, and everyone has fun. Sometimes your friend forgets that she is the spy, keeps accusing everyone else at the end of the game, and then refuses to believe that they only option is that she is the spy. Drinking and gaming, friends! Save the Game of Thrones board game for long winter nights, and bust out some fun, simple games this summer!